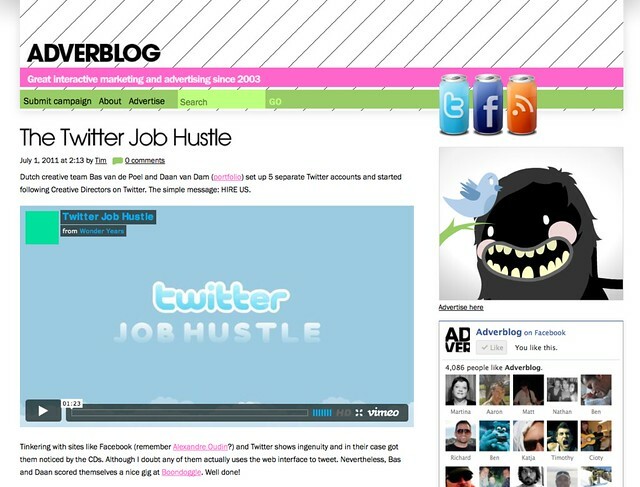 A week ago I got asked to be a contributor to Adverblog which I was massively chuffed about. I have been reading Adverblog for 5 years now and it has always a great source of inspiration. Being on the editing side now is a brilliant new experience. Dutch creative team Bas van de Poel and Daan van Dam (portfolio) set up 5 separate Twitter accounts and started following Creative Directors on Twitter. The simple message: HIRE US. Tinkering with sites like Facebook (remember Alexandre Oudin?) and Twitter shows ingenuity and in their case got them noticed by the CDs. Although I doubt any of them actually uses the web interface to tweet. Nevertheless, Bas and Daan scored themselves a nice gig at Boondoggle. Well done! This entry was posted in Advertising, Social Media and tagged adverblog, boondoggle, twitter, twitter hustle. Bookmark the permalink.